The King and the Clown Is Story of Everyman. December. 22, 2005 03:02. by Seung-Jae	Lee sjda@donga.com. The King and the Clown is a very substantial movie. Taking even one scene out would be as dangerous as carving out a crucial organ from your body. 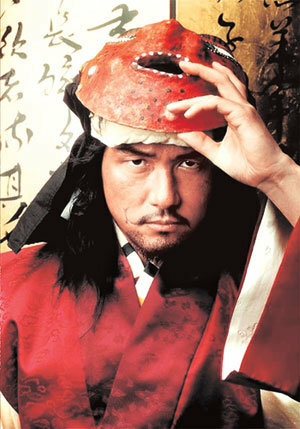 The movies plot takes place during the Joseon Dynasty. Jang-saeng (played by Gam Woo-sung) is a clown in the Namsadang troupe who abandons his troupe after realizing that it had degenerated into a plaything for the aristocrats. With a fellow clown named Gong-gil (played by Lee Joon-ki), whom he loves deep in his heart, Jang-saeng leaves for Hanyang for a new life. There he leads a show troupe and with his exceptional talent makes the troupe famous with a show that satirizes King Yeonsan (played by Chung Jin-young) and his favorite concubine, Nok-su (played by Kang Sung-yeon). King Yeonsan, who happens to see to the show, falls in love with the performance and provides living quarters for the clowns in the palace. He soon starts to cast amorous glances at Gong-gil, however, which causes Nok-su to fall into a jealous rage and devise an evil plot. It is true that the phrase, theatrical has been used in a negative sense meaning unrealistically exaggerated, but The King and the Clown completely twists around the meaning of this phrase. This film is very theatrical in the sense that it has an absorption force so strong there is no time to question its reality. Based on You (Yi), the highly acclaimed play that received many awards since its first performance in 2000, the movie more than exceeded the quality of the play by wisely applying the original works scenario and dialogue, knowing what to put in and what to leave out. Like the risky tightrope dancing performed by Jang-saeng and Gong-gil, this movie successfully walks the tightrope between jest and pathos, as well as between the hunger for power and the hunger for love. The last scene in which the two clowns walk on the tightrope together may well be the last scene of the year. The complicated love relationship that occurs between Jang-saeng, Gong-il and King Yeonsan goes beyond being a special, homosexual love and reaches the viewers as a universal concept of sad love. This is because the movie touches the sentiments of the viewers, teaching us that happiness and sorrow are, after all, twins that come from the same source. The shows performed by Jang-saengs troupe and the doll play that Gong-gil performs for King Yeonsan are enjoyable in themselves as plays within plays. These scenes gradually blend into the main story, sometimes becoming a testimony to the characters emotions and sometimes predicting the characters fate. It is unbelievable that such a masterpiece could have been made with only 4.4 billion won. Moreover, the visuals in this movie bear a life of their own, due to the truthful directing that aims to dig into the deepest aspects of the characters emotions. Lee Joon-ki, the mysteriously beautiful man, shows amazing freshness, and Gam Woo-sungs distinct phonation especially shines in this period film. Chung Jin-young, always as good as usual though never gaining much attention, effectively reinvented the insane king by overwhelming the audience with an intensely expressionless face that looks ready to explode at any minute. The powerful force that comes from their acts makes it impossible for the audience to hate a single character in the movie. Perhaps all men in the world, whether good or bad, live like the men in The King and the Clown, harboring a patch of sorrow and remorse within their hearts. To be released on December 29. For ages 15 and up.